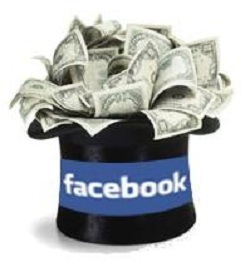 The Coming Facebook Initial Public Offering – How Many Pols Will Profit? The Financial Times has put up an article about the coming initial public offering of Facebook stock, and as I read it, I wondered: “How many politicians will get fat[ter] on this IPO when it happens? Going as far back as the early 1990s, I remember stories of how then Speaker of the House, Tom Foley, managed to get in on an unusually large number of IPOs. It looked very strange, since getting in on initial offerings of stock is a highly lucrative segment of the market, but it’s harder than you might think, yet somehow, I think politicians must have an edge. Of course, as Peter Schweizer has described in his book Throw Them All Out, we can easily guess that it has very little to do with luck. Politicians seem to have an edge in virtually every department, but what we should realize about this is that they’re simply adept at working the system. The insider information in which they trade enables them to make money in ways you and I cannot, and what’s worse is that if you and I behave as they do, it’s huge fines and jail for us little people. As you watch Facebook go public someday soon, you might stop and wonder as you click through the pages which politicians are getting richer as you browse through those pages. After a number of shocking disclosures including Nancy Pelosi’s Visa investments, and continuing scandals involving the President’s crony connections, what is becoming increasingly clear is that they don’t think they’ve done anything wrong. So corrupt has official Washington DC become that the people working there by and large do not see anything immoral in their behavior, since they may well have stayed within the laws. Some are calling this “soft corruption,” but in truth, there’s nothing “soft” about it. That’s cold hard cash they’re raking in by virtue of insider information. If you or I were to behave in the private sector as Minority Leaders Pelosi(D-CA) had behaved in her elected position, we would face imprisonment. Of course, the larger problem is that Pelosi isn’t alone, and the corruption isn’t limited to Democrats. As Big Government is reporting, Representative Spencer Bachus(R-AL) seems to have an uncanny ability to pick market winners with the most incredibly profitable sense of timing. While his profits from the trading are small potatoes compared to Pelosi’s Visa profits, it’s indicative of how bad things have gotten. On Sunday night, speaking with Stephen K. Bannon on his “Victory Sessions” radio show on KABC, Andrew Breitbart called for Bachus to resign. How can we combat this? These people have sworn an oath, and yet all too frequently, it seems the only allegiance they actually express isn’t to the people of the United States Constitution, but to their own wallets, and the purses of their cronies. I believe we need to tighten up the laws on our Federal elected officials. 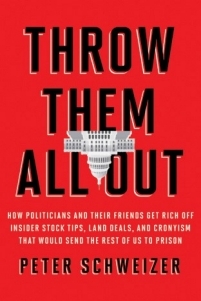 Peter Schweizer’s new book, Throw Them All Out, promises to reveal a number of instances of this pervasive corruption, and Spencer Bachus was just one of the people Schweizer’s book identifies as having serious problems. The senior leadership of both parties in Congress have been playing this game for a long time, and this new book exposes the systemic breadth of the problem. Throw Them All Out will be released officially on Tuesday. Pelosi’s spokesman claimed that she’s not corrupt, and that the author of the book is merely a partisan attack dog, but if so, why did he go after Republicans too? Since former Alaska Governor Sarah Palin began hammering on the issue of crony capitalism back in August, it’s become a more visible issue. Most people hadn’t really understood what all the fuss was about, or what the distinction between capitalism and crony capitalism really is. They’re now learning. What can be done to curtail this sort of profiteering from elected office is another question. Another complicated problem is how Congressional staff might also have access to confidential information, and thereby profit in the markets. It’s difficult to know how we should draw the lines, and how to make rules difficult to circumvent. After all, these are the people who write our laws, and if they can’t be trusted, neither can the laws they author be considered anything but suspect. It makes one wonder about the political gamesmanship that goes on during crises, like the Debt Ceiling debacle of late July/early August: How might legislators have turned a profit from the wild gyrations of the market that they were effectively causing? What about the S&P credit rating downgrade? Who in Washington DC might have profited from that calamity? These are all questions to which we must demand answers. It’s not enough to simply pass campaign finance laws, because that hardly scratches the surface. We must address the baseline of corruption that now seems to be the norm in our federal establishment, and it’s time we held our elected representatives to account. If the people of Bachus’ or Pelosi’s districts don’t demand answers, it will provide us a new dilemma: How can we defeat entrenched corruption when even the voters won’t eject their members of Congress? We’ve seen this before. It may well be time to do as Schweizer suggests: Throw them all out. Now.